And here's another snowflake for the Robert's Snow auction. Bidding starts on November 19th...Let it snow! A couple weeks ago, we had some friends over, and their 9-year old son walked into the living room and beelined to our coffee table to pick up a book. "Cool!" The book was Matt Tavares' Oliver's Game, which I had picked up in anticipation of this profile. Now really, what baseball-loving child *wouldn't* be drawn to these meticulous, breathtaking illustrations? There is so much great detail in Matt Tavares' work...even my husband (a Cubs fan) got quite absorbed in the sepia-toned details of old Cubs pennants and memorabilia on the walls of Oliver's grandpa's store. Matt Tavares has published 6 books with Candlewick press, including a great version of Grimms' fairy tale, Iron Hans, just out this Fall. His work has been showered with Parents' Choice Gold Awards, a Massachusetts Book Award Honor and the International Reading Association Children's Book Award, just to name a few. And he lives right here in Maine! I've always loved to draw. When I was a kid, I spent countless hours coloring and drawing. I had an amazing art teacher in elementary school named Barbara Gagel. My mother spoke with Barbara when I was in kindergarten, and told her that I was interested in art, but she wasn't sure how to help me with it. So Barbara really took me under her wing, and gave me extra art lessons after school, and every now and then she even took me and a friend to the Museum of Fine Arts in Boston. She went way above and beyond what any teacher should be expected to do, and really helped get me get excited about art. It also helped to have two supportive parents who were always interested in seeing whatever picture I was working on. Who knows, I might have still become an illustrator if I didn't have such supportive parents, and if I didn't have Barbara Gagel as my art teacher in elementary school. But maybe not. That's why my first book, Zachary's Ball, was dedicated to Barbara, and since then I've dedicated books to my mother and father. I got my start in children's books in 1997, when I wrote and illustrated a picture book as my senior thesis at Bates college. That book, Sebastian's Ball, eventually turned into Zachary's Ball (after much revision), published by Candlewick in 2000. When I look at the original pictures from Sebastian's Ball now, I'm actually amazed that anyone from Candlewick actually wanted to publish it, because some of the pictures are really awful. But thankfully, they saw potential in it, and here I am ten years later working on my 8th book with Candlewick! I'm inspired by my two daughters, and by my wife Sarah. I'm inspired by great books, and great art. On a day-to-day basis, I think the thing that inspires me to get up early every day and get right into my studio is the fact that I love the whole creative process, and I love being able to spend my days making books. I feel very lucky to be doing what I'm doing, and I want to make sure I work really hard so I don't screw it up! I love a lot of the art from the 17th century, like Caravaggio and Rembrandt. Some of my all-time favorite illustrators are Arthur Rackham, Jessie Wilcox Smith, and N.C. Wyeth. As for current picture book illustrators, I'm a big fan of Brian Selznick, Kadir Nelson, P.J. Lynch, and I'm incredibly jealous of David Wiesner, both for his amazing books and for his room full of Caldecotts. My studio is pretty ideal. It's at home, so I don't miss too many major events, like my daughter's first steps. But I can close the door, and be in my own little world. When I'm drawing or painting, I'll put on some music (usually something somewhat mellow, like Elliott Smith, Ben Folds, or Aimee Mann), sit down at my table with my picture in front of me, my iced coffee to my left, and my paints, brushes, water, and pencils to my right. When I'm writing or researching, I usually don't listen to any music, and since all I need is my laptop or a notebook, sometimes I like to go sit at a coffee shop in town while I'm writing. It's good to get out of the house every now and then. Your fantasy books Iron Hans and Jack in the Beanstalk are in full-color, while your baseball books are in black and white or incorporate a very subdued sepia effect like in Mudball and Oliver’s Game. What are the challenges and benefits of each medium, and how do you decide which method to use for each project? My style/process has changed a bit with each book I've worked on. I didn't plan it that way- it's really been dictated by each story. For example, I was originally going to illustrate Jack and the Beanstalk in black and white. But once I started working on it, it became clear that the beanstalk just needed to be green, and the golden harp just needed some yellow, to make it shine like gold, and Jack's world needed to be a bit dreary at first, and bright and sunny at the end, etc. So I ended up using color. But for a book like 'Twas the Night Before Christmas, the whole idea was to make a book that looked like it was from the early 19th century, when that poem was first printed. So black and white made sense. I try to keep an open mind with each new project, and that way I don't get stuck in any one style, and I can keep changing and growing as an artist. As for challenges and benefits, black and white is tricky because you have less to work with. But, in general, it's quicker, and I always love how monochromatic art makes your brain work a little bit- you know the sky is blue and the grass is green, even though it's drawn with graphite. Working with color tends to take me much longer, because there are just so many more variables. I'm definitely getting more comfortable working with color, and at this point, there are just so many more things I can do with color than with black and white. Still, I'll probably do more black and white books. How did you come up with your snowflake design for this year’s Robert’s Snow? My family took a trip to Monhegan Island, off the coast of Maine. It's a beautiful place, so I decided to bring my snowflake, and I painted a scene from the deck of the house where we were staying. I liked the idea of someone hanging my snowflake on their Christmas tree, knowing that it was painted on a warm summer day, on an island off the coast of Maine. Once you began, was there anything especially interesting, challenging, or surprising about the project? Everyone must ask this: How did you become such a huge baseball fan? I grew up near Boston. 'Nuff said. What advice would you give to young people interested in becoming an artist? Draw, draw draw. And keep drawing, even after you draw something that you think is really, really bad. Draw from life. Ask a friend or family member to pose for you, and try to draw them. Even if you want to be an abstract artist, or a painter, or a sculptor, or a computer artist, first learn how to draw. 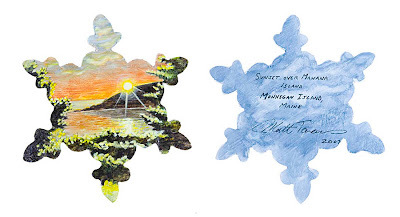 Thank Matt Tavares for donating his time and talents and let him know what you think of his snowflake, "Sunset Over Manana Island"
Spread the word! Tell your grandmother, your neighbor, your postman. Send them a link to this post or to any Robert's Snow post. Such detail -- his artwork is so different from his snowflake -- yet the use of light and details is the unifying thing. 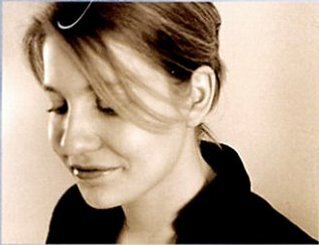 A really great interview! Thanks for this great interview with Matt. The first time I heard Matt speak was at In Celebration of Children's Literature at the University of Southern Maine at Gorham several years ago. I was so impressed with his first book. What a talented young man he is! Thanks to artists like Matt, Robert's Snow has been and will be a resounding success again this year. This is such a great feature. I love his art work and haven't even seen Irons Hans yet and must remedy that. I love love LOVE that story about his art teacher. Thank you, Josephine and Matt (who has good taste in music)! What a great interview and I love his snowflake, especially the idea of a beautiful Maine summer day hanging on a Christmas Tree.